Note: The following post is intended to be a resource for my ancient art students. If you know of any good examples of basic formal analysis that are available online, please leave links in the comments section below! I would like to build up a list of resources for my students. Formal elements are things that are part of the form (or physical properties) of a work of art: medium, line, color, scale, size, composition, etc. Formal analysis involves an exploration of how these formal elements affect you, as a viewer. Formal analysis involves describing a work of art, but formal analysis goes beyond mere description. Instead, description is used as an agent to support the argument-at-hand. Although your essay will likely introduce a work of art with some general descriptions, the rest of your descriptions should be very pinpointed and with purpose. Make sure that such detailed descriptions are used to back up specific points of your argument. For this formal analysis assignment, your argument will revolve around some type of reaction to the work of art. The front panel of the Great Lyre sound box (shown above) is an example of Sumerian art from the Ancient Near East.The panel is divided into four different registers. These registers contain four scenes with figures (mostly animals) involved in various activities. Despite the rather rigid compartmentalization of the four sound box scenes, the overall effect of the front panel of the Great Lyre sound box is one of energy and dynamism. Such energy can be seen in the color of the figures and in curvy compositional lines. The sound box is comprised of two different colors, a dark black and a light tan. These colors are caused by the medium of the panel. Dark black is the color of bitumen, which is used for the background of the panel and lines. Light tan is the color of the inlaid shell that is used for the bodies of the figures and objects. The stark contrast of light tan against a dark background adds a sense of dynamism to the figures. The figures seem to glow and hum with life. Furthermore, these lightly-colored figures are pushed closer toward the viewer, away from the black background, which gives the figures a sense of presence and energy. The composition of the figures also lends itself to this idea of energy. The figures fill the whole space of their respective registers and scenes, giving them a strong, energetic presence. In fact, some figures strain and twist so that their bodies can fill and fit within the register space. Such dynamic twisting is especially seen in the two bulls in the upper-most register (see image above). These bulls are symmetrically placed on either side of a central human figure, creating a “Master of the Animals” motif. The bodies of the bulls twist inward toward the human figure, and but their necks and heads twist outward and slightly downward. The theme of curves and energy is underscored in the beards and hair of these three figures: each lock of hair ends with a bouncy curl. Energy can be seen in the curvaceous lines of other figures as well. In the second register from the top, the backs and tails of the hyena and lion are comprised of swooping lines. In fact, the lines of the lion’s back are reinforced and highlighted by swooping, short lines that suggest the lion’s bushy mane. While the lion’s mane swoops toward the center of the scene, the lion’s lower back curves in the other direction. These opposing compositional lines give the panel an added sense of energy and movement. In the second register from the bottom, the back of the bear curves upward and downward in a lyrical, dynamic swoop (see image above). In fact, the whole body of the bear is placed at a more dynamic angle, since the bear is leaning toward the lyre placed on the left side of the scene. 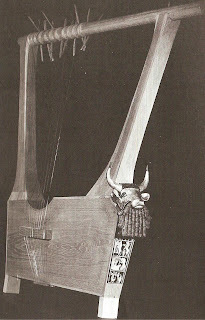 Some of the strings of the lyre curve upward toward the right, opposite the angle of the bear’s body, to add more opposing movement and dynamism to the overall composition. The lowest register of the front panel contains some of the most dynamic curves and lines. The most obvious curve is found in the tail of the scorpion man on the left side of the scene. This tail curls and swoops upward, only to end with a stinger that loops downward. The shape and detail lines of the scorpion tail are also energetic. The tail is comprised of several oval shapes of decreasing sizes. These shapes are combined together to creating a visually dynamic, bouncy outline for the tail. Furthermore, the tail is full of energy because of the multiple lines that appear within each oval shape. These lines look a little like a maze or labyrinth; they visually reinforce the idea of movement through their repetition and interlocking layout. The front panel of the Great Lyre sound box embodies energy in many ways. This energy can be seen not only because of the colors of the panel, but also through several compositional devices and lines. Such visual interest in energy is fitting for this piece, given that this sound box originally hummed with musical vibrations and the energy created by sound. For further information about formal analysis, you may want to look at the chapter, “Formal Analysis” by Anne d’Alleva. Preview is available online here. Bah! I found another problem with something in Stokstad’s recent Art History text. I promise that I’m not spending my time scouting out errors in this book – they just happen to pop up. I like a lot of things about Stokstad’s approach to art history, but these minor errors and misleading statements are making me question whether I want to use this textbook for my classes. (Plus, it’s making me wonder: what other incorrect or misleading statements in the text could have escaped my notice?) Man, if I ever decide to give up teaching, maybe Pearson Prentice Hall would hire me as an editor for their future editions of Art History. 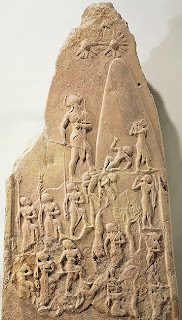 Right now I’m bothered about Stokstad’s discussion of the Victory Stele of Naram-Sin (2254-2218 BCE, shown left). Stokstad writes about the significance of “the inscription” on the stele – which suggests that there is only one inscription.1 In reality, though, there are two inscriptions: one that was written by Naram-Sin, and another inscription (which is most prominent and recognizable) that was written about 1,000 years later. Not only does Stokstad fail to recognize that there are two inscriptions, but she also implies that the second (clearly visible) inscription is the one that was written to commemorate Naram-Sin’s victory. This simply isn’t true. 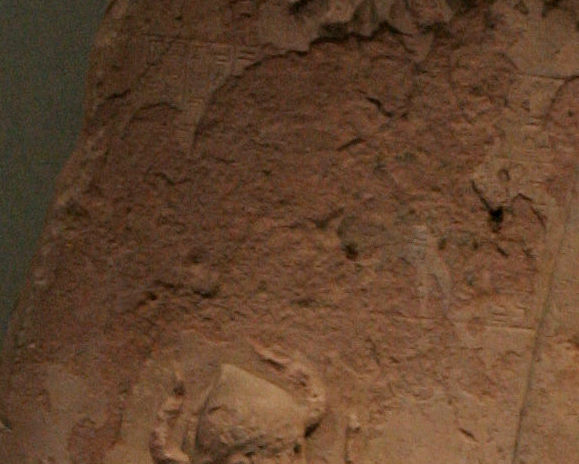 This inscription is partially worn off (it is outlined by a rectangular shape over Naram-Sin’s head) and states that Naram-Sin was victorious over the Lullubi people of the Zagros Mountains. The inscription was likely made at the time when the rest of the stele was fashioned. This week my class has been reading a fascinating essay by Marian H. Feldman which discusses this latter inscription. (It is because of Feldman’s article that I noticed the misleading information in Stokstad’s book. Only after sorting out the two inscriptions did I discover that the most recent edition of Gardner’s Art Through the Ages correctly describes the two different inscriptions. At least one general survey text has the correct information!) Feldman uses the Elamite inscription as a springboard to discuss how different Mesopotamian monuments became loot and booty after multiple wars in the ancient Near East. She discusses the various ways that conquering Mesopotamian groups would mutilate or deface artistic spoils of war. It’s a really interesting essay, and I especially like her comparisons between ancient looting and the 2003 raiding of the National Museum of Iraq. In regards to this stele, I liked Feldman’s discussion of how Shutruk-Nahunte chose to associate himself with Naram-Sin in the second stele inscription. Feldman writes, “That Shutruk-Nahhunte did not overwrite or obliterate Naram-Sin’s original inscription, as he did with other captured Mesopotamian monuments, and moreover, that in his own inscription he attributed the stele to Naram-Sin by name, suggests that this particular monument possessed a significance beyond simple war booty. Rather, Shutruk-Nahhunte’s knowledge of the stele’s association with a charismatic, if dishonored, ruler of the first great Near Eastern empire imbued the monument with added value.”2 It’s neat to think about how the value and meaning of this stele has changed over time. Anyhow, thanks to Marian H. Feldman, I’ve now got my two inscriptions straight. Let’s hope that Stokstad straightens out her own error in future editions of Art History. 1 Marilyn Stokstad and Michael W. Cothren, Art History, 4th edition (Upper Saddle River, New Jersey: Prentice Hall, 2011), 36. 2 Marian H. Feldman, “Knowledge as Cultural Biography: Lives of Mesopotamian Monuments,” in Dialogues in Art History, from Mesopotamian to Modern: Readings for a New Century, Elizabeth Cropper, ed. (London: National Gallery of Art, Washington, 2009), 44. This past weekend, my family and I traveled to visit the Washington State Capitol Building. It’s always fun for me to identify the different architectural features on such buildings, and particularly to think of Western/European counterparts which may have inspired such features. But as we approached the bronze doors of the capitol (c. 1923-28, see detail on left), I paused. Bronze doors are a common feature in Western architecture, but what about the lion’s head doorknockers? What’s their history? I could think of earlier lion’s head knockers, such as the Ottonian ones on the Hildesheim Cathedral, but I wasn’t sure if there might be an earlier example. So, what’s the significance of lion’s head doorknockers? Did they symbolize anything, or were they just decorative? I haven’t come across any speculation on the subject, but I think that there must have been some symbolism involved. Lions held symbolism in lots of ancient cultures, and often embodied power and strength. I have a theory that lion’s head doorknockers were intended to serve the same symbolic function as the lion statues which decorated the gates of the Hittites (Hattusha Lion Gate, c. 1400 BCE, see above right) and the Mycenaeans (Lion Gate at Mycenae, c. 1250 BCE). In each case, these intimidating lions serve as guardian beasts for the city, as well as symbolize strength and power. I think the same thing can be said for lion’s head doorknockers, which rest on the doors (i.e. gates) as guardians of a building. On a side note, though, it’s interesting that not everyone today associates lion’s head doorknockers with such ancient symbolism. This fascinating study by Zachary McCune mentions a woman who selected a lion’s head doorknocker for her home, but only because the same knocker was found on the door of the UK Prime Minister’s house. In this woman’s case, it appears that she wanted her knocker (and her home) to have some connection and/or status with this association to the Prime Minister. Do lion’s head doorknockers have any particular meaning or symbolism for you? Can you think of an ornate doorknocker (of a lion’s head or otherwise) that you particularly like? 1 “The Evolution of the Door-Knocker,” The Art World 3, no. 5 (1918): v, vii-viii. 2 Sterling Dow, “Review: Excavations at Olynthus,” The American Historical Review 47, no. 4 (July 1942): 824. It’s been a while since I posted any introductory posts. 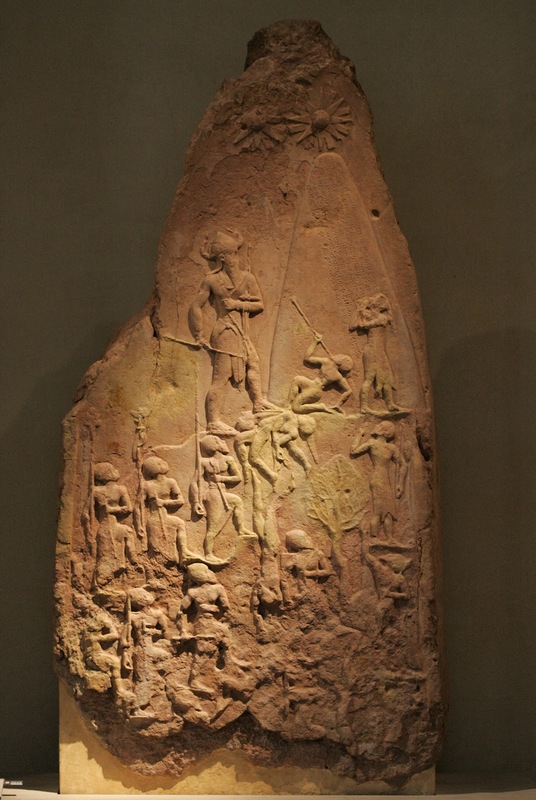 I thought I’d briefly write about one of my favorite stelae from the ancient Near East period, the Victory Stele of Naram-Sin (shown below, 2254-2218 BC). This pink sandstone stele is my favorite piece of Akkadian art. 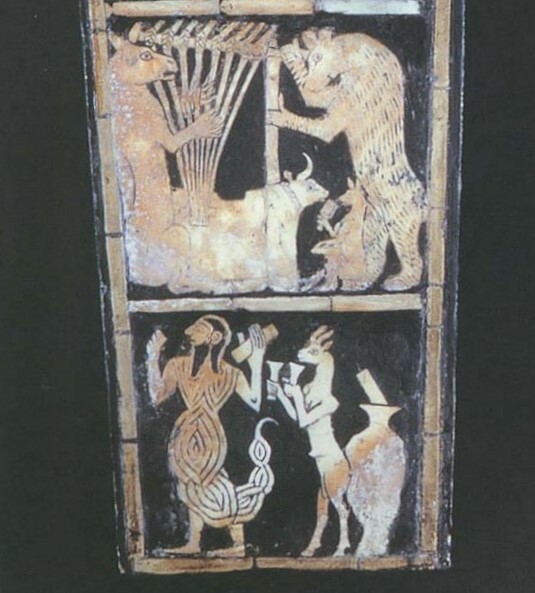 It is one of the first pieces of art to depict an actual historial event; the stele commemorates Naram-Sin’s victory over the Lullubi people. Hierarchy of scale is used in this composition, which means that the most important figure (in this case, Naram-Sin), is shown bigger than anyone else. Naram-Sin is walking up the mountainside, with his smaller soldiers marching behind him. If you look closely, you can see that Naram-Sin is treading on top of two fallen Lullubi soldiers. The thing I like most about this stele are the stars depicted at the top. There are only two stars shown because the top of the stele is damaged, but it is thought that at least three favorable stars shown on the king. I read a footnote here which mentions that once there may have been seven stars on this stele. I’ve had professors posit different ideas about these stars. 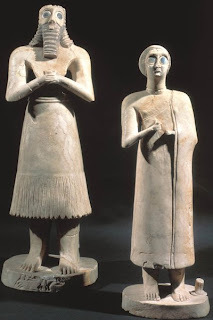 Some think that the two depicted stars represent the dieties Shamash (the primary diety for the Akkadians) and Ishtar (the goddess of love, marriage, beauty and war). Therefore, the inclusion of these stars could indicate the gods’ favorable view of Naram-Sin. It also could be that Naram-Sin is walking up the mountainside in order to make a sacrifice to the gods, thanking them for his victory (which further propagandizes that Naram-Sin has divine support). This theme (the relationship between rulers and diety) is familiar in ancient art, which makes me think that this theory has some creedence. 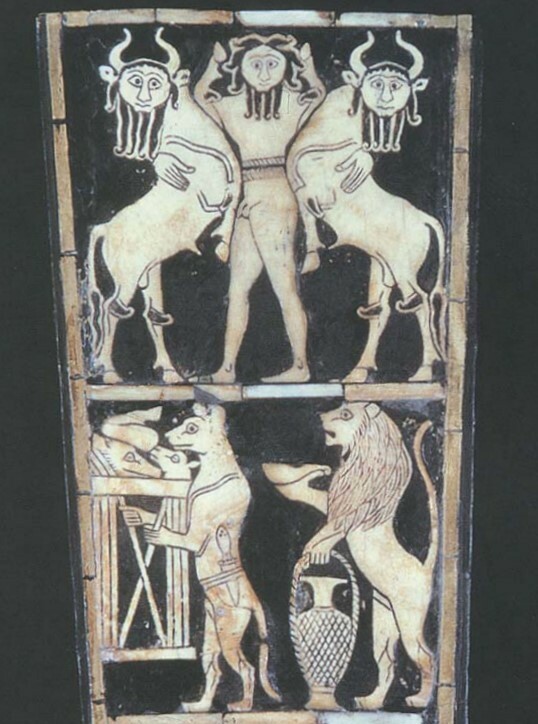 But if there were other stars depicted on this stele, which gods did they represent? How can we ensure that the attribution of gods to stars is not arbitrary? I’ve had another professor who wondered if these stars could represent an actual cosmic event that took place during the battle or victory. I think this is a really interesting thought, though I don’t believe there is any extant evidence to support this idea. It’s kind of fun to think about, though. Since this stele was one of the first pieces of art to depict a historical event, it’s fun to think that historical accuracy extended to a depiction of what the stars looked like. What do you think about these stars? What’s your favorite part about this stele? 1 Dominique Collon, et al. “Mesopotamia.” In Grove Art Online. Oxford Art Online, http://www.oxfordartonline.com.erl.lib.byu.edu/subscriber/article/grove/art/T057228pg2, accessed 7 August 2009.